Reading the synopsis for Ashes left me eager to delve in: it ticked all the boxes for me ‘ apocalyptic, flesh-eaters, electromagnetic pulses pulverising the Earth into submission. I have to say, I wasn’t let down. Chaos ensued from the first page and continued until the second half of the book, in which there came a lull in the story-line and the thrill factor. But not to despair: it picked back up again and Alex, the main character, was plunged head-first into an entirely new bizarre situation upon her arrival in a town named Rule, a place mainly occupied by the elderly and the ‘Spared’ ‘ those not in want of living human flesh and, in some cases, the proud new, albeit confused, owners of a super-sense. It is here that Alex finds comrades and conspirators. It is here she discovers that she really does not know who to trust in this ‘brave new world’. The pages leading up to the grand finale of this first part Bick’s trilogy left me in a flurry of excitement and exasperation, willing the pace on, eager to know more ‘ then BOOM ‘ cliff-hanger ending. Gotta love ’em! The sequels Shadows and Monsters will be coming in 2012 and 2013. 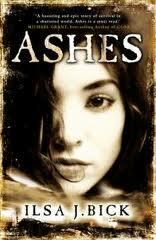 Ashes, released on the 29th September, is aimed at a YA readership (12+), It’s a brave new apocalypse, folks!